Here’s a chance to travel like a celebrity, and to meet one. American Airlines just launched their new Guaranteed Smoothness Sweepstakes to promote their Five Star VIP travel assistance, and the winner of the drawing will receive a VIP trip to Los Angeles and will get to meet Michael Bublé. Beginning today, the American Airlines Five Star Service Guaranteed Smoothness Sweepstakes offers customers the opportunity to register for the chance to win a VIP trip to Los Angeles complete with American’s Five Star Service and an exclusive, VIP meet-and-greet with legendary smooth jazz singer Michael Bublé. “Our celebrated Five Star Service offers customers personalized assistance that ensures an expedited and hassle-free travel experience,” said Nancy Knipp, American’s Managing Director – Premium Services. A $2,000 American Express gift card to be applied toward hotel, dining, shopping and more. It cost between $125-$200 for Domestic Five Star travel assistance. The service has received good reviews (like this one from Marshal Jackson when he purchased Five Star Service for his mom as a Mother’s Day gift), and though I can’t imagine actually needing the assistance for myself, I’ve been tempted to try it just so that I can check out the Flagship Check-in area at LAX. As for the sweepstakes, I have to confess that I had heard the name Michael Bublé but wasn’t sure why he was famous (now I know), which isn’t a comment on him or his celebrity so much as the fact that my iPod is living in the 90’s! • OPEN TO/ENTRY DETAILS: Open to legal residents of the 48 contiguous United States and the District of Columbia who are 18 years or older. • Sweepstakes begins at 11:59 a.m. [Central time (“CT”) April 27, 2012 and all entries must be received by 11:59 a.m. CT time on June 11, 2012. • PRIZE DETAILS: Two (2) Grand Prizes each with an ARV of $8,400. Total ARV of all Prizes: $16,800. I had to listen to that damn song four times a day for two months because of some undergrad lab assistant. Then I went on vacation to Vegas and stayed at the MGM, where they were playing it nonstop as an advertisement for an upcoming tour. Hopefully “five star service” includes the option to NOT meet Michael Buble. Who the heck is Buble and why should I care? Unless he’s the one carrying my bags (and looking to extract a heft tip in addition to the hefty up-sell) this is not the program for me. If I win without entering, give him the day off. 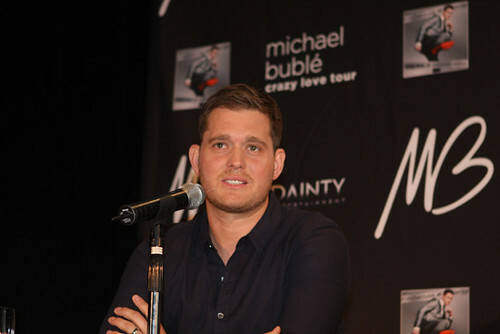 @ Cedarglan – LOL, I’m of the same mind – while I wouldn’t mind the trip to LA, I’d just as soon skip hanging out with Buble! I have to admit, I liked one of his songs – which I can’t recall the name. I ABSOLUTELY LOVE Michael Buble! I have enjoyed his songs since the day I first heard him. I use his songs in my Cycle and Line Dance classes that I teach and now EVERYONE knows who he is (which is why I can’t get the good seats to see him anymore 🙁 ). Just finished reading his book. I just love his voice, style and sense of humor. You go Michael B! @ Carrie – I hope you win!! I’m guessing you are ExPlat and if so you can access the flagship check-in at LAX — its not much really, just a corner of the airport lobby with an escalator up to the Priority Line. Entered, and wanted to know when is the final date to enter? Been a fan since he started~ He brought back the American Songbook with a style all his own. He struggled to get where he is and he deserves the notarity he has gotten. Love ya Mike! @ Lastdance – I didn’t know anything about how he got his start, but after your comment I read his biography. Wow, what an improbable beginning! It’s good to see someone succeed because of their determination, hard work, and talent. Thanks for reading and good luck in the contest!! @ Lastdance – He has an inspirational story and definitely deserves the success. 🙂 Hope you get to meet him! Can you please tell me how and when we will know who is the winner of the contest? I couldn’t see that info anywhere here~ Thank you! @ Lastdance @ I love him – The actual drawing is on June 18. The winner will be notified by phone or by certified email (I’m assuming they either captured that info with each entry or they’ll send you an email and ask for you contact information). Here’s how they describe the notification process. Good luck! On or about June 18, 2012, a random drawing will be conducted from among all Eligible Entries received by American, whose Administrator, an independent judging organization, will select the Winners in a random drawing from among all Eligible Entries received by Sponsor. The Administrator’s and Sponsor’s decisions will be final in all matters relating to this Sweepstakes. The potential Winners will be notified by phone and/or certified mail. The potential Winners may be required to sign an affidavit of eligibility (which affirms that he/she has complied with these Official Rules) as well as a liability release, and where legal, a publicity release, each of which, if issued, must be completed, signed and returned within five (5) days from date of issuance, or the Prizes will be forfeited and awarded to an alternate Winner to be selected in a random manner from among the remaining Eligible Entries received. If any Prize, Prize notification or attempted notification is returned as undeliverable, the Prize will be forfeited and will be awarded to an alternate Winner to be selected in a random manner from among the remaining Eligible Entries received. Except where prohibited, acceptance of a Prize constitutes Winner’s consent to use of his/her name and/or photograph without further compensation for advertising, promotional and publicity purposes by Sponsor. By accepting Prize, Winners acknowledge compliance with these Official Rules. If a potential Winner is considered a minor in his/her jurisdiction of residence, the foregoing documents must be signed by his/her parent or legal guardian and such Prize will be delivered to minor’s parent/legal guardian and awarded in the name of minor’s parent/legal guardian. @ Michele and Carrie – They haven’t publicly announced the winner’s name yet. When they do, they’ll post their name to this list of promotion winners. Who won? Will it be posted here? I waited all day but my phone never rang!